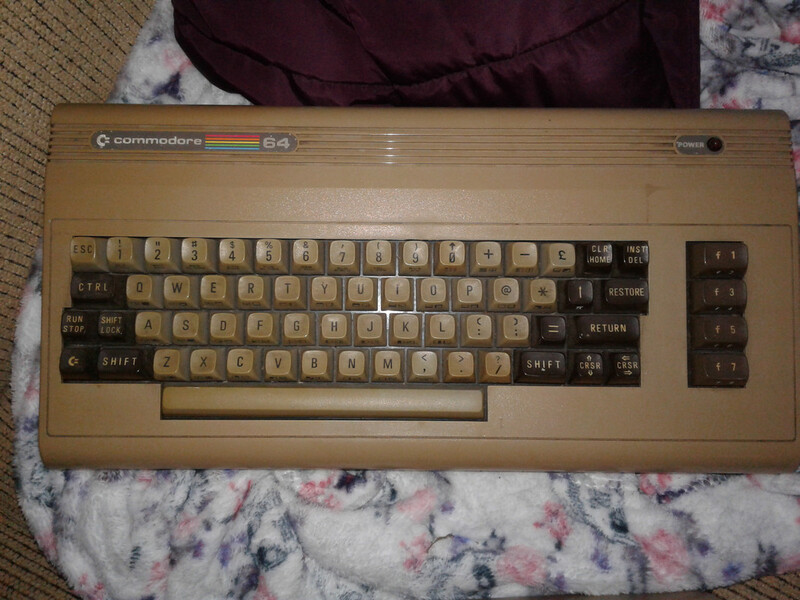 Anybody know anything about this C64? Has ESC key instead of back arrow and keys colored different. I have 8 C64s and this is the only one with this look. Don't think it came this way. Somebody on Facebook mentioned it's probably off a C16. The VIC's keyboard doesn't have an Escape key, it's the same layout as the C64 and fully compatible - I ran my workhorse Breadbin with a VIC keyboard for a few years after the one it came with started getting ropey and then swapped again for a C16 keyboard, but that does need the circuit board under the keys swapping out. The latter Frankenkeyboard is, a few services later, still in use on a C64C to this day. At one point in time there were a lot of surplus and junked Commodore parts and keyboards at surplus stores. I also made a custom keyboard by changing keycaps like that. As a matter of fact, my first C64 was built from a 4064 board that was sold cheap. The 4064 was simply a 64 board in a PET casing, however the SID was missing and the boot colors were different, so off to surplus it went. I was able to jam it into a VIC case and it worked! I too am the proud owner of a VIC-20 with a keyboard that's a mishmash of VIC-20 and C16 keys. Sometimes I mixed keys as well, if they were available. Remember that the C64 started as a $599 expensive business machine. The first run had a number of chip issues (such as with uneven SID sound), and they updated a number of motherboard issues with later C64s. Maybe it's a first-year 64 you have there? When I was in school, they had a whole wall of PET machines with the integrated monitors. That was 1985!